Going outside to get some fresh air has always been a great way to reenergize your workday. And these days, you can bring your work outdoors with you. 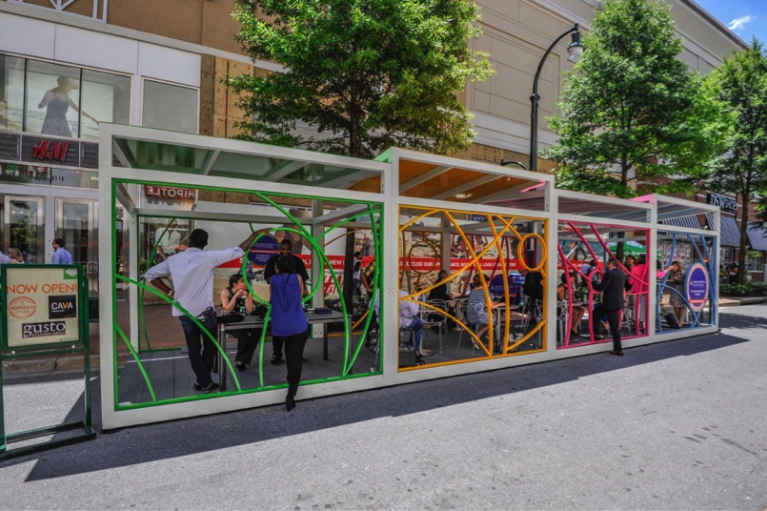 Outdoor office spaces are the latest trend in a string of innovative and ever-evolving solutions for the changing workforce. The rise of the gig economy means on-demand workers now make up a large portion of the workforce (as of 2015, 53 million Americans worked as freelancers), and new technology is enabling companies to hire remote workers in increasing numbers. With their sleek design and modern amenities, outdoor office spaces are providing workers with new options, as well as a little fresh air. OUTBOX in Silver Spring, Md., seats 20 outdoor workers. 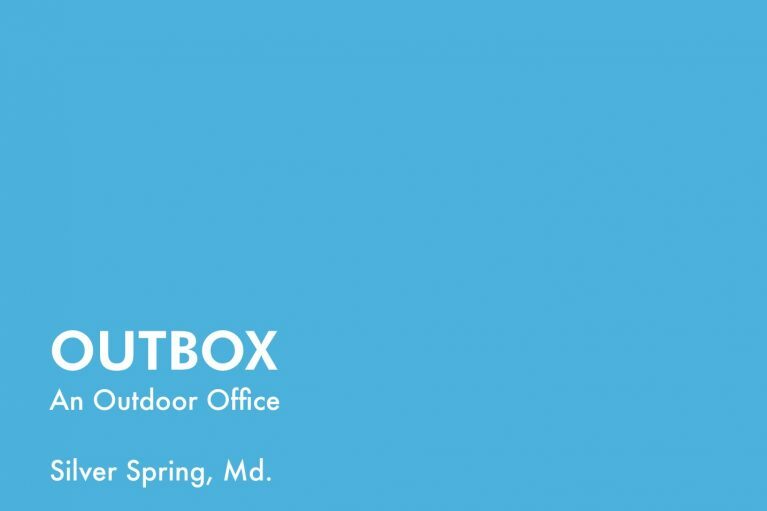 In downtown Silver Spring, Md., Peterson Companies, a development firm, has opened OUTBOX, a 20-seat outdoor office space inclusive of free wireless internet access and charging stations. “We considered the many professionals, freelancers and artists in our dense urban district, both working from a traditional office and home—all looking for a way to get out of the confines of their cubicle or office, get some fresh air or inspiration, and have the conveniences of shops and dining at their fingertips,” says Laurie Yankowski, regional marketing director for Peterson Companies. When it came time to design the space, the development firm decided to look to the innovative design ideas of the architectural technology students at nearby Montgomery College. 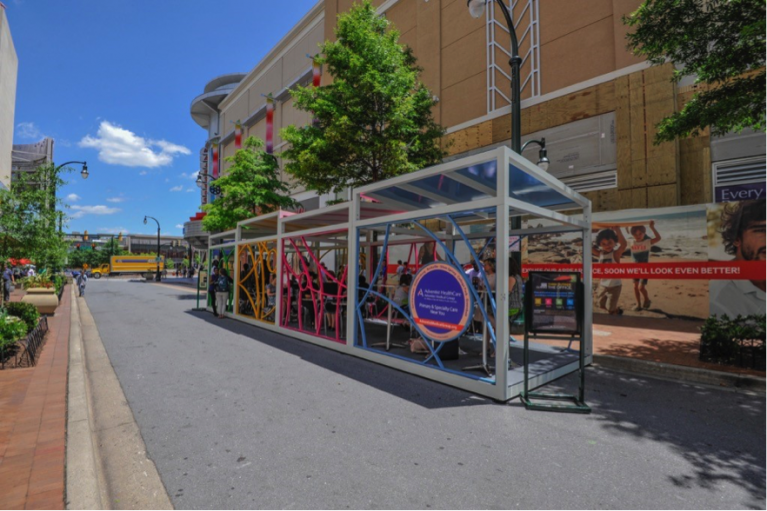 The winning design met all the necessary technological standards—including Wi-Fi and charging stations—while seamlessly incorporating the colorful, artistic feel of the area. The space has become a fresh-air option to work, create and be inspired. 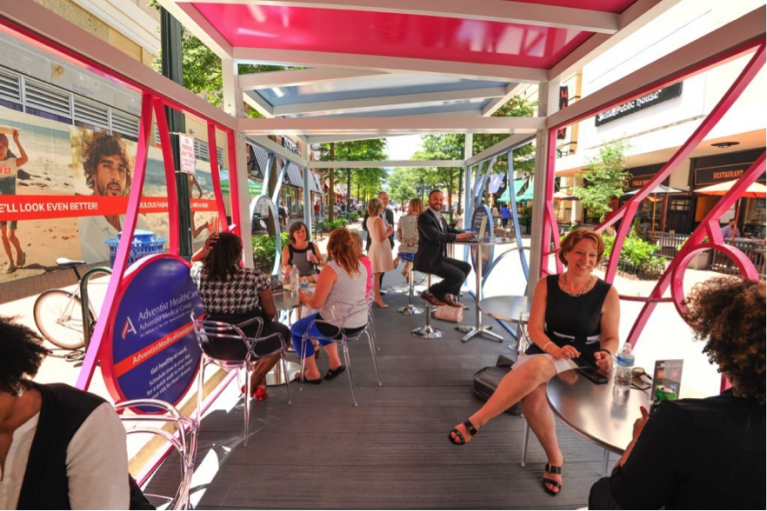 For Washington, D.C.-area residents, the outdoor office movement doesn’t stop there. Just a few miles down the road, the Golden Triangle Business Improvement District sets up free Wi-Fi, tables and chairs each Friday. Meetings of up to 24 people can be held in the outdoor space, simply by setting up an online reservation. Across the Atlantic, a Dutch startup is taking the trend a step further by offering pop-up offices throughout the city of Amsterdam. Popices is taking over unused spaces, such as parks, rooftops, and even boats, and setting up Wi-Fi-enabled offices that will be available through September. Companies can choose a space to rent out for a day or two, while individuals looking to shake up their daily workspace can secure a spot through a ticketing system. Looking ahead, Long Beach, Calif., was recently awarded $300,000 through the Knight Cities Challenge for their project, The Outdoor Office. Though the project still has a long way to go, the plan would turn a portion of Harvey Milk Park into a permanent outdoor office space equipped with free Wi-Fi, charging stations, shady areas and flexible seating arrangements. Though each outdoor office space offers its own unique design, all of the concepts seek to provide a free community workspace for the ever-growing freelance base, as well as professionals typically confined to a traditional indoor office. Sure beats squeezing into a loud coffee shop on a nice summer day. It is in the heart of the arts and entertainment district, surrounded by shops, restaurants and live entertainment. Patrons have free range to set up the space as they see fit for meetings, work lunches or brainstorm sessions. It will be available through early fall, as long as the weather cooperates. Maintaining Workplace Performance: Take That, Competition!